HomeOther SportsOrange Watch: Which Syracuse athlete was most impressive last year? Orange Watch: Which Syracuse athlete was most impressive last year? 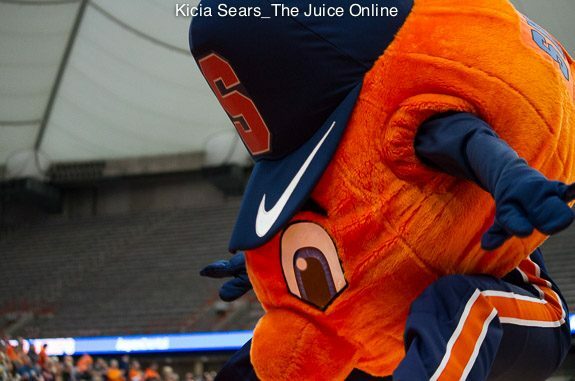 Syracuse University mascot Otto the Orange. Mandatory Photo Credit: Kicia Sears, The Juice Online. Item: While it’s a sport that doesn’t command the attention of its football/basketball campus-mates, we’d be remiss if we did not cite one of the top performances by any Syracuse athlete both this past 2017-18 school year, and over an entire four year Orange Career. Track and Field standout Justyn Knight leaves The Hill with two individual NCAA championships during his recently-completed senior season, the first SU athlete in 37 years to accomplish that feat, along with a 2015 NCAA cross-country team title. Not too shabby. We’ll always remember Hall of Fame lacrosse coach Roy Simmons Jr. proudly citing the rare national championship in Syracuse athletics history, after his Orangemen had thrillingly knocked off the sport’s stalwart Johns Hopkins 17-16 in the 1983 NCAA title game at a pre-renovated Rutgers Stadium (in an era of Div. I lacrosse in which the postgame media session was essentially pulling up chairs around a table in an empty locker room to ask coaches and players questions). Innocently, during the immediate moments of postgame excitement when the realization of the meaning of the win was starting to settle in, Simmons incorrectly cited the championship being the school’s first since the 1959 football team went unblemished to the No. 1 ranking, and toppled Texas in the Cotton Bowl for good measure. The 1978 men’s Varsity Eight and Freshmen Eight, and 1981 Varsity Four crew teams, on their home course Onondaga Lake, had won IRA national titles (recognized as the national championship for men’s crew because the sport is not sponsored by the NCAA) in between the football and lacrosse championships, three of the 22 titles for men’s crew, the most of any SU sport (lacrosse has 15 trophies – NCAA and USILA combined). Simmons’s point was that the words “national championship” and “Syracuse athletics” weren’t exactly going hand-in-hand during the immediate decade of the Post World War II era right up to the Carrier Dome’s debut (1980), but in the 38 subsequent seasons of dazzling Dome and Manley Field House complex moments, the school has witnessed 14 team and five individual national championship performances. The last two of which belong to Knight, the easy going Toronto native who last fall won the NCAA Cross Country individual crown at Louisville, and followed that up with winning the 5000 meters at the NCAA Indoor Championship at Texas A&M in March, and finishing runner-up in the 3000 meters, leaving little doubt as to the Syracuse nomination as the top male ACC athlete of the year to be announced in late June.